Technorati is a household item among blog publishers. Supposedly a “blog search engine”, it’s only practical applications are checking the number of blog originating backlinks, and estimating a blog’s earning potential for advertisment services such as Text Link Ads. So lately it began to receive a lot of negative attention. J Wynia – “Unfortunately, Technorati’s feeds that are driven by tags don’t support the same filters that the HTML-based tag searches do and even less than the full-text search does.” This could be overcome with a crafted search request, but decent results require API access with a developer key. More Christian Montoya – users gaming the “authority” benchmarks. Technorati is littered in LiveJournal and MySpace personal journals that dilute from the concept of blog publishing. Those are not even the so-called Z-listers that are just starting out, but a whole new Alpha-list category that documents their daily life for the world to see. To illustrate my point, a search for “work up this morning” results in over 300,000 records. That makes approximately 500 daily posts of people informing the world that they have awakened during yet another morning. 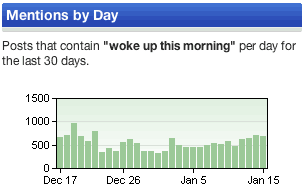 This is complimented by almost as many “went to sleep” posts (250,000 total) at the end of the day. Worse yet, any mention of an acquaintance one met anywhere in between or around waking up and going to sleep, results in a linkback from the same social network. Brillant, we’ve now established that sleeping with one’s MySpace network and “blogging” about it is directly proportional to one’s “authority” according to technorati… Well, I suppose there is a niche market for anything. Though there needs to be a way to distinguish between “authority” on your own social circle, from a technical “authority” on a particular tag’s subject. PostRank for RSS anyone? The point here, of course, is that the aweful signal to noise ratio of Technorati search makes it difficult to discover new blogs (not journals) that are starting out, even with great quality. It is a closed loop where the A-list blogs get all the traffic and links, in large part just for being on that A-list. And since Technorati makes the cutoff at 100 mark (out of 55 million), that’s a pretty darn narrow group to break into. Technorati’s longtail seems way too noisy for practical use. It’s funny how it’s becoming a metric of “blog success” (yay, I’m at 4500 now) but not that useful for search. I still think the best way for people to get noticed is by writing good content and linking to other bloggers who aren’t so far in the A List that they still check who is linking to them. You know, when I wrote about everything that’s been bothering me about Technorati, I didn’t realize that I was bashing them around the same time as everyone else. Not that I feel sorry for them… after years in the business they should have accomplished more by now! engtech – a metric is fine, we need those too. Though in such a case I’d expect more stats, and deeper analysis.